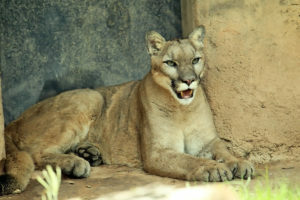 Depending on the region in which it is found the cougar may be called mountain lion, mountain cat, puma, panther, or catamount. This large, solitary cat has the greatest range of any large wild terrestrial mammal in the Western Hemisphere extending from Yukon in Canada to the southern Andes of South America. The cougar is the second heaviest cat in the American continents after the jaguar. Adult male cougars weigh up to 250 pounds. Females are generally much smaller. Conservation Status: Near threatened. Mountain lions were once almost driven to extinction. They are now making a comeback in the US expanding eastward. In Western US, many are coming into suburban neighborhoods. Humans are the main threat to these animals. Cougars have extremely powerful legs and they can jump farther than any other cat: 30 feet forward and 18 feet straight up, even if they don’t get a running start!